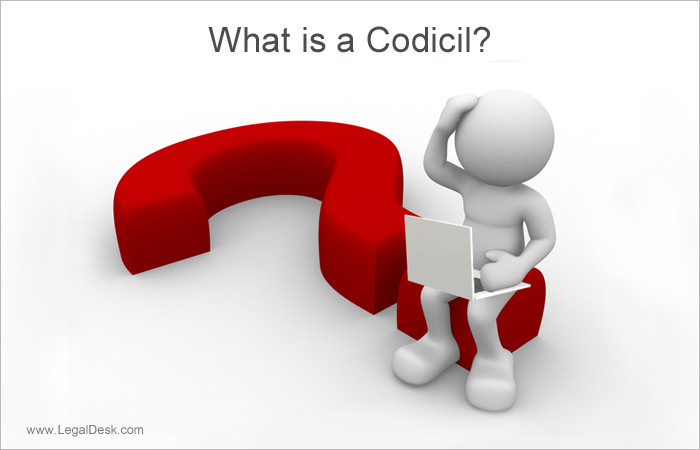 How To Make A Codicil? Have you made a Will with respect to your properties, savings, assets and all that you leave behind when you die? Is there something you want to change in the Will that you made? A change can be in the form of addition, deletion or substitution of some clause or name or property or date etc, with a new one, or any other type of change that you wish to do in your Will. For this you cannot make these changes directly in the Will document, and if any alterations are seen in the Will document, it becomes void. So how to make alterations to your Will? Simple! You have to draft all the alterations, clearly mentioning each clause and the change done, in a separate document. This document is termed as Codicil in law. A Codicil can be made only to an existing Will, not to any future Wills. The Codicil is to be read as part of the Will and is considered as an extension of the Will. The person who has made the Will, i.e. the Testator, shall be the person who also makes the Codicil and signs it in the presence of two witnesses. The date on the Codicil should be very clear. What Should Be Included In A Codicil? The name of the Testator, the person who made the Will, his address, age and father’s name just as mentioned in the original Will. The date and place of making the Codicil. The clauses in the Will with the correct sub-clauses, sub-headings etc which the Testator wishes to amend or change. The Clauses to be changed should be exactly numbered as in the Will without giving space to any ambiguity. The new additions or deletions or substitutions that are to be incorporated into the Will. The exact places in the Will where the new changes are to be inserted. Signature of the Testator in the same manner as in the Will. Two witness signatures after the Testator’s signature is placed. A codicil need not necessarily be in a Stamp Paper, it can be written in a plain paper also. The Codicil so made should be kept along with the Will. A Codicil becomes legally valid once it is drafted and signed by the Testator. Testator in the Will and the Codicil should be the same. The signatures should match. Date of codicil should always be a date after the date of Will, and not a date prior to the Will. A Codicil should have the Section and Clause of the Will in the same format. Two witnesses should sign the Codicil. 1. My mother made a Will in my name for the entire property she owns. But now she wants to include the name of my brother also to the will. Can she edit the previous Will? Or should she make a totally new will? Since your mother wants to only include your brother’s name she can make a Codicil mentioning her desire and keeping it along with the Will. A Codicil can be created by drafting the details she wants to include and the amendments she wants to do in the original Will, in a separate paper and sign it in presence of two witnesses who also sign the document. 2. Can we alter the will by directly adding any sentence or word in the will document and putting our signature in those places? No, you are not supposed to do even a single change in the original Will document directly. Any change of ink, or handwriting or any insertion or deletion of letters or words in the Will document may lead to suspicion and can create a chance for a long legal battle. The only way you can make changes to your Will is by creating a separate document called Codicil. 3. Do I need to register the Codicil I made to my earlier Will? A Codicil need not be registered. It has to be signed by the Testator and attested by two Witnesses. So are you looking out to make those specific alterations to your Will that you made sometime ago? Are you worried of paying a huge lawyer fees? Or have no time to draft it yourself? Then don’t worry. 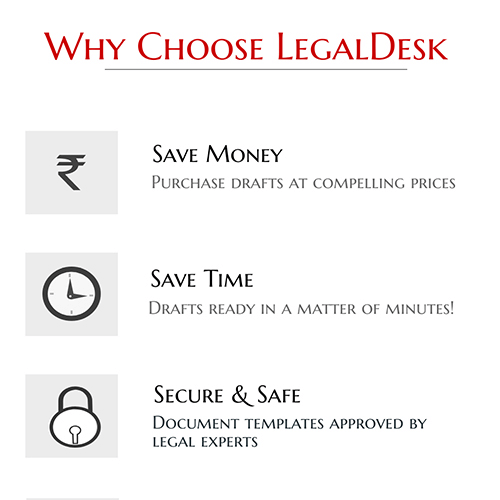 Legaldesk.com is the only helping friend that can solve your frustration with a well structured and legally correct customizable Codicils or Will amending documents. Just contact us if you can’t do it yourself. Visit our website and create your own document at a fairly less price.